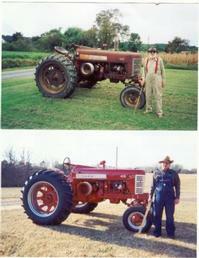 This 450 was restored in honor of Mr Merrill Belote of Melfa VA. He was the original owner for over 42 years. Mr Belote is in the before picture and I am in the after picture. With a lot of time and hard work 'BROTHER MERRILL' is standing tall.